Taipei's National Palace Museum houses an astonishing collection of Ancient Chinese artefacts and artwork. Representing over 5000 years of Chinese history, it is the largest and perhaps finest collection of Chinese art in the world. 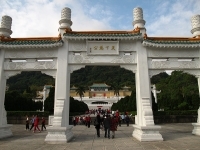 Once displayed in the Forbidden City, Beijing, the collection was moved to Taipei as a result of the Chinese Civil War. Visitors can view world-famous exhibits such as the 'Jade Cabbage' (a piece of jade carved to resemble a cabbage head), and a valuable copy of the Qingming Scroll. Transport: MRT Tamsui-Xinyi Line to Shilin Station and then bus R30 (Red 30). Other routes that will take you to or near the Museum plaza are buses 255, 304, Minibus 18 and Minibus 19. Opening times: Daily from 8.30am-6.30pm. Free guided tours in English at 10am-3pm daily.